Copley Place is a large modern mixed-use complex, with features such as an upscale shopping mall, parking garage, office space, and two hotels. The shopping mall includes many luxury retailers such as Ralph Lauren and Tiffany & Co. Copley Place is located at the southwest corner of Copley Square, which can be considered the heart of Boston’s Back Bay District. The complex opened in 1984, and greatly revitalized the area. At that time, many shoppers had abandoned the downtown for newer suburban malls, and completion of Copley Place began to draw shoppers back into the city. Copley Place mall has two levels, with a central atrium and large skylight. The shopping mall is fashionable and attractive. The complex is connected via walkways to the Back Bay train station, and to the Prudential Center, which is extremely convenient and highly beneficial during inclement weather. 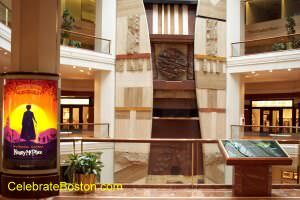 Copley Place is named in honor of John Singleton Copley, the famous American painter. Copley is best known for his full-length portrait paintings, of which several have been thankfully preserved in the collection of Boston's Museum of Fine Arts. He also painted many stylized historical subjects, which reinforced his fame and popularity. A statue of Copley was erected in Copley Square facing Boylston Street, next to the fountain. The inscription on its base states: "John Singleton Copley, 1738-1815, Boston and London, American Portrait Painter, Member Royal Academy." There are several points of interest near Copley Place. The Boston Public Library, Copley Square, and Trinity Church are across Huntington Avenue. The Prudential Center, Prudential Skywalk attraction, and Hynes Convention Center are connected to the complex via the elevated walkways. Also, the Newbury Street shopping area is located only two blocks north on Dartmouth Street. Just to the west is historic Fenway Park near Kenmore Square, and to the east is the Public Garden, Cheers Beacon Hill, and Boston Common. Walking Directions: Exit the station (it's located at Boylston and Dartmouth Streets). Walk south down Dartmouth Street and the Boston Public Library will be on your right. The mall is two blocks away on the right. The Westin Hotel, which is one block closer, also has connecting walkways and is a popular method for entering the mall, especially in harsh weather.